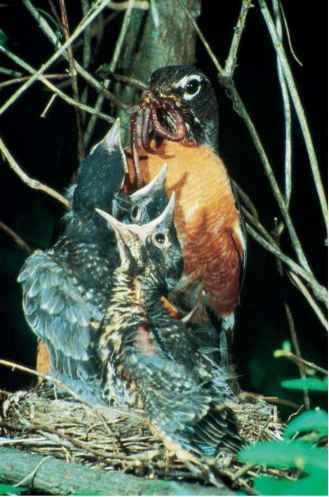 Thrushes are monogamous, but both males and females will take the chance to mate with others if an opportunity arises. Families are, however, reared by both members of the pair. 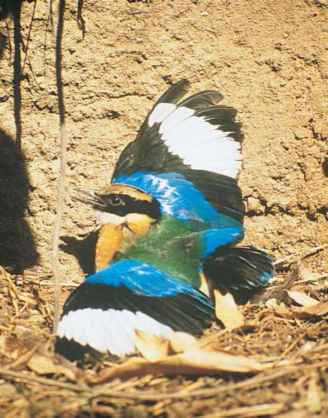 Indeed, it is generally the case that male and female share nest building, incubation, and feeding duties. are, however, large and aggressive birds and usually able to drive away most potential predators, swooping at cats and squirrels and even striking the heads of people if they get too close. Mostly, thrushes are much less demonstrative. American robins and blackbirds, among others, nest in some unusual places; thrushes have been found nesting between the lights of traffic signals, for example. Blackbirds are likely to build inside a garden shed or garage, finding a shelf or ledge somewhere to accommodate the nest, but risking failure if they become shut out (or, indeed, shut in). Occasionally, blackbirds and European robins have succeeded in rearing young from a nest built inside a vehicle or boat that is in regular use. Northern wheatears nest in holes in the ground or among piles of rocks or in dry-stone walls. A small heap of tiny pebbles or sand may make a kind of porch at the entrance to a nest hole. Redstarts are particularly likely to use wooden nest boxes, either with a small round entrance hole or an open-fronted design. Eastern bluebirds have been helped by the provision of large numbers of nest boxes that make up for the loss of natural cavities. While other species may lay a single large clutch to coincide with a seasonal flush of food, and still others live much longer, lay just one or two eggs, and put all their effort into rearing a single chick, thrushes typically lay several small clutches through the course of a season. The end result is the same, but it is a different strategy: more hit and miss. From each clutch, only one or two chicks might survive; eventually, almost all will die in the winter. Perhaps a dozen eggs will be laid, 10 may hatch, and nine of the resultant chicks will die, through disease, starvation, accident, or predation. So long as one adult survives the winter, the single surviving chick is enough to keep the population stable. Chicks hatch naked and blind and develop a coat of down before growing their first feathers. Chicks of larger thrushes tend to leave the nest several days before they can fly. They are probably too exposed to predators in the nest, which becomes easy to locate as the large adults constantly fly in and out carrying bills full of food, and the chicks themselves beg for food with loud, far-carrying calls. So, while the chicks might seem extremely vulnerable on the ground and unable to fly, they must have a better chance by splitting up and hiding away in the bushes than by staying in the nest. Smaller chats nest in holes or make domed nests, some with a more or less developed entrance tunnel, carefully hidden in thick vegetation at or close to ground level. They have larger clutches and rear just one or two broods, putting more effort into each than the big thrushes. They risk being around longer as they feed the chicks in the nest until they are ready to fly, but then the nests are harder to find. Birds such as the stonechat, however, impart a remarkably agitated, worried impression as they perch nearby with a bill full of caterpillars or flies, undecided whether to give the game away or dive in to feed the hungry chicks.